As a supplement for my collection of China to be used for serving of afternoon tea (China tea cups, White Element serving dishes & Blå Blomst tea cups), I have been upcycling a set of Blå Blomst China tea cup and cake dish into a serving item. I found the China tea set in a local second hand shop, afterwards I went to the local cafe & decoration shop Cafebutikken Vejle, where I have, that old China cups and plates have been turned to such serving items. My mother could not believe her own hears, when I told what I had done !!! Destroying China ike this by drilling holes into it !!!! Vandalism !!!! 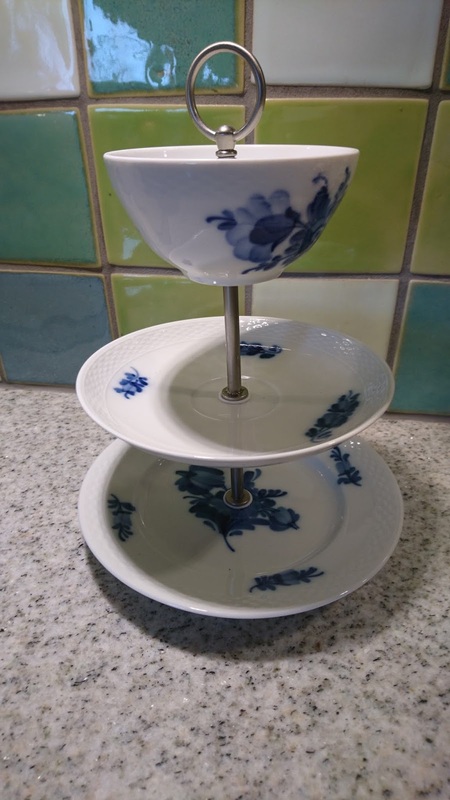 It costed me 129 DKK to have the Cafebutikken Vejle drilling holes and assembled into such a serving item + the price for the actually China. And it can happen, that the China breaks during the drilling process. All in all I am very happy about the outcome. And my mother has forgiven me for my "vandalism against Royal Copenhagen China", when she saw the result. I have a similar item in Christma style in the planning process for serving sweet treats in connection the upcoming Christmas.